4.1 out of 5 based on 59 bloggers and 5 commenters. 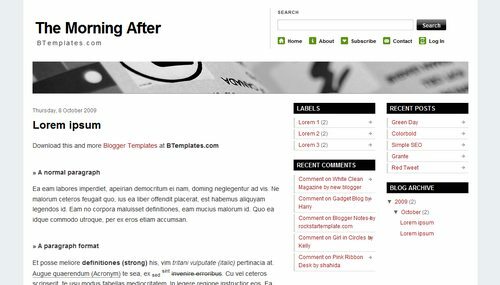 The Morning After is a free blogger template adapted from WordPress with 3 columns, right sidebar and neutral colors. Great theme. Thanks for providing this. Very clean template. I like the use of white space. People today don’t seem to be interested in the multi-colored blogs, just the simple blogs that have good content. How can i change “contact”, “about”, beacause i’m really interested. Please, if you can, write me an e-mail. Thanks for the template. How big is the photo banner? Can the size be adjusted?